Description Of Item: Cursed for all eternity, Scareglow? 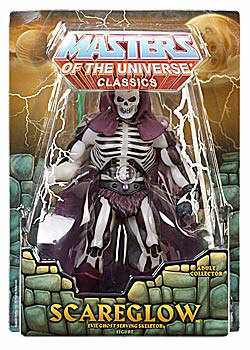 is one of the evil henchmen of Skeletor�. Able to strike fear in the hearts of even the most worthy opponents, his spirited action figure is highly-detailed and fully-articulated, and comes complete with these accessories:Scythe of Doom and Cursed Grayskull reliquary.